There are 10 of the 1-strength Mercenary cards and 8 each of the 2-, 3-, 4-, 5-, 6-, and 10-strength Mercenary cards in the deck. The number in parentheses indicates how many of each type of special card there are in the deck. When a Winter card is played, immediately discard all Spring cards in play. Winter's harsh cold and famine reduce the effectiveness of soldiers. If a Winter card is in play when a battle is concluded, all Mercenary cards are considered to have a printed strength of 1. This applies to all Mercenary cards in every player's battle line - including the cards of the player who played the Winter card. Example: A player has two 10-strength Mercenaries, one 5-strength Mercenary, and one 4-strength Mercenary, for a total strength of 29. However, if a Winter card were in play, the player's total strength would be 4. The effect of Winter cards is not cumulative; if more than one Winter card is in play, the effect is the same as if only one Winter card were play. When a Spring card is played, immediately discard all Winter cards in play. The warmth of spring improves the morale and vitality of soldiers. If a Spring card is in play when a battle is concluded, each player adds 3 strength to each of his Mercenary cards that is among the highest- strength Mercenaries in play. If two or more of Mercenary cards are tied for the high- est strength, all the tied cards gain the 3 additional strength. Example: In a two-player game, Scott has one 2- strength Mercenary and two 5-strength Mercenaries in his battle line; Chris has one 1-strength Mercenary, one 4-strength Mercenary, one Heroine, and a Spring card in his battle line. Because Scott's 5-strength Mercenaries are the highest-strength Mercenaries in play, he adds 3 strength to each of them, for a total strength of 18. Chris's total strength is 15. None of Chris's cards gain 3 strength, since none of his cards are the highest-strength Mercenary cards in play. The effect of Spring cards is not cumulative; if more than one Spring card is in play, the effect is the same as if only one Spring card were play. passed during that battle. The Bishop card is dis- carded after it has been played and its effects have been resolved. The player who played the Bishop card then receives the Favor of the Pope token, and must immediately decide whether to place it on a region that does not contain a control marker or leave the token off the game board. The Condottiere token may not be placed on any region that has the favor of the Pope. The Favor of the Pope token represents the Church intervening on the region's behalf and ensuring that no battles are fought there. Example: In a two-player game, Chris has one 6- strength, one 3-strength, and two 1-strength Mercenary cards in his battle line. Scott has one 6-strength and two 1-strength Mercenary cards in his battle line and plays a Bishop card. Since the highest-strength Mercenary card in play is 6, all 6-strength Mercenary cards are discarded from both players' battle lines (even the player that played the Bishop card). Scott then receives the Favor of the Pope token, and must decide whether to place it on a region that does not have a control marker or leave the token off the game board. If, during the "Compare Strength" step of a battle's resolution, a player's battle line contains the most Courtesan cards, that player receives the Condottiere token instead of the player that actually won the battle. The player who won the battle places his control marker on the contested region, but the player with the most Courtesan cards receives the Condottiere token (he chooses where the next battle will be fought, and takes the first turn in the next battle). If two or more players tie for the most Courtesan cards, the winner of the battle receives the Condottiere token. If two or more players tie for the most Courtesan cards and two or more players tie for the most total strength, then the Condottiere token is passed to the player to the left of the person who last controlled it. The Courtesan has a strength of 1 but is not considered a Mercenary card (and is therefore not affected by Winter, Spring, Drummer, or Scarecrow cards). Note that the Courtesan card has a red rather than an orange border and that its strength value appears on a silver seal rather than a shield. A Drummer card adds to the morale of the battle line it is played in. When a battle is concluded, Mercenary cards in the same battle line as a Drummer card have their printed strength doubled. Playing multiple Drummer cards is allowed, but has no further effect (that is, the value of the Mercenary cards is not tripled, qua- drupled, etc).. If a Winter card is in play during the battle's resolution, each Mercenary card of the player with a Drummer card will be worth 2 strength instead of 1 strength. Example: Carrie has a total of 21 strength from three Mercenary cards. If she plays a Drummer card., her army would be worth 42 strength, or 6 strength if a Winter card is also in play3. If a Spring card is in play during the battle's resolution, a player with a Drummer card in his battle line should double the printed strength of his Mercenaries before adding the additional 3 strength granted by the Spring card. Example: John's battle line consists of one 2-strength Mercenary, one 4-strength Mercenary, and a Drummer. A Spring card is also in play, and the highest-strength Mercenary card in any player's battle line is the 4- strength Mercenary. John's total strength is 15. The Heroine has a strength of 10, but is not considered a Mercenary card (and is therefore not affected by Winter, Spring, Drummer, or Scarecrow cards). Note that the Heroine card has a red rather than an orange border and that its strength value appears on a silver seal rather than a shield. Scarecrows are intended to trick the enemy. 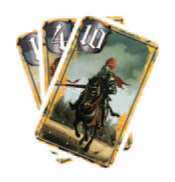 Playing a Scarecrow card allows a player to retrieve one of his own Mercenary cards from his battle line back into his hand. When a play- er plays a Scarecrow card, he may choose not to pick up a Mercenary card. A player may not use a Scarecrow card to retrieve a special card, a card from another player's battle line, or a card from the discard pile. The Scarecrow card is discarded after it has been played and its effects have been resolved. When a player plays this card, he immediately brings the battle to an end, and the region is captured by the player who has the strongest battle line at the moment the Surrender card is played.